Working in higher education and - more specifically and more importantly -working with college students is not just a job. It is my calling. It is my passion. This portion of my website will probably receive more adjustments, tweaks, and fine tuning as I continue serving college students and working hard to help students get the most out of their higher education. The majority of the content found here will probably be transferred from the work I completed for my graduate study at Azusa Pacific University. Some things will look exactly the same, some I will probably slightly modify, and other items I will probably completely overhaul as I learn more about what I do not know. In no way am I an expert in higher education, far from it actually. None of the ideas found here are new or groundbreaking. It is simply a collection of my thoughts and the hard work of great women and men who have come before me and made American higher education an unrivaled global establishment. The journey through college is an exciting experience, but more importantly it is a crucial time of personal development and transformation. Students gain valuable knowledge and skills that are crucial for their success in all areas of life. The goal of higher education is provide students an atmosphere of academic, social, emotional, and spiritual support where they can be challenged to greater levels of development. To be successful and graduate college as individuals prepared to be leaders, students must be committed to the ideas of learning, community, and service. Education is (or should be) the center objective at every school, but in college it is essential for students to develop critical thinking, that “internal compass” that leads them to discover “multiple perspectives, respect diverse views, think independently, and establish and defend their own informed view.” Students who acquire this appreciation for learning are better prepared for life after college (Magolda 2003). Being committed to a higher cause results in a more successful college experience. Students who regularly participate in volunteer service projects are shown to be more successful in their academics, committed to social responsibility, and likely to aspire higher levels of education (Astin, Sax, Avalos 1999). Additionally, volunteering encourages interactions across racial lines which promotes multicultural understanding among students (Astin & Sax, 1998). Helping students become a productive part of society is an important aspect of student development. Some of the most important skills and experiences a student gains in college are discovered inside deep, meaningful, supportive relationships found in the community. Students who are actively involved with their peers and faculty are more likely to succeed in college (Astin 1999). Arboleda, A., Wang, Y., Shelley, M., & Whalen, D. (2003). Predictors of Residence Hall Involvement. Journal of College Student Development, 44(July/Aug), 518-531. Astin, A.W., Sax, L.J., & Avalos, J. (1999). Long-term effects of volunteerism during the undergraduate years. The Review of Higher Education, 22(2), 187-202. Astin, A. W. (1999). Student involvement: A developmental theory for higher education. Journal of College Student Development, 40, 518-529. Astin, A. W., & Sax, L. J. (1998). How undergraduates are affected by service participation. Journal of College Student Development, 39(3), 251-263. Magolda, M.B. (2003). Identity and Learning: Student Affairs’ Role in Transforming Education. Journal of College Student Development, 44(2): 231-247. I am the product of a private Protestant evangelical Christian university education thus it should not surprise anyone that I am a big supporter of private higher education. However, I do not feel that private schools are inherently better or that public institutions are less equipped. Both play an important and equal part of the American higher education equation. Simply adding Christ-focused activities to complement our educational curriculum is not enough (Beers & Beers 2008). 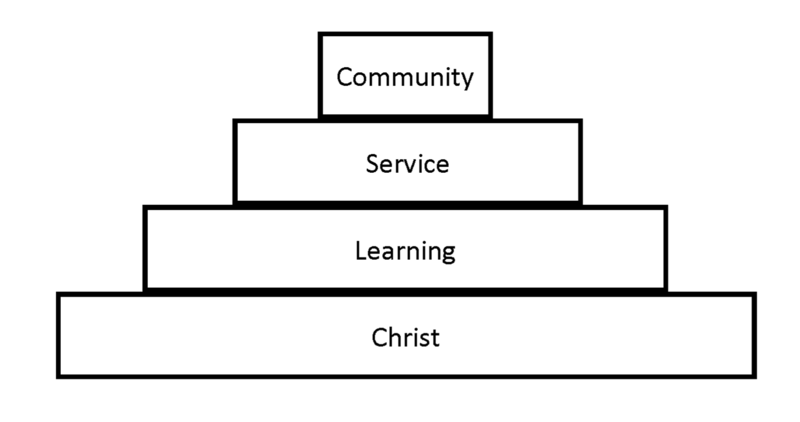 Christian Higher Education must take these three aspects of higher education and construct them on the foundation of Christ. The value of Learning, Service, and Community will be magnified by the truth of our Lord Jesus Christ. Christian Higher Education must strive to create a Christ-centered community for students that deepens their faith, encourages learning, and promotes service.